Monolayer cell cultures are extensively employed in drug screening and radiotherapy studies. However, their ability to reliably predict in vivo therapeutic responses is limited because they do not resemble the tumor microenvironment . Three-dimensional (3D) multicellular tumor spheroid (MCTS) models have been proposed to address this shortcoming . MCTS are spherical symmetric cell aggregates that can simulate the in vivo conditions and thus serve as in vitro models for hypoxia, pH gradient, gene expression, and drug screening studies . 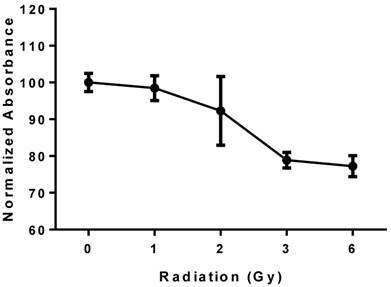 Despite increased range of use, the application of MCTS in mild hyperthermia (40-42 °C) and proton beam radiation (PBRT)-based studies to understand radiobiological outcomes is limited. The objective of this study was to investigate the ability of MCTS to reliably determine the therapeutic response of cells to PBRT and low temperature-sensitive liposomes (LTSLs). The unique properties of MCTS allow high throughput analysis of radiobiological phenomena (Fig. 1). The core of MCTS is similar to the avascular hypoxic regions of tumors, and relies on diffusion-mediated particle transport [4-6]. In our previous in vivo studies, we achieved improved intratumoral delivery and distribution of systemically administered doxorubicin (Dox) within both the tumor periphery and core by inducing rapid intravascular doxorubicin release from LTSLs . These LTSLs have lysolipids incorporated into the liposomal membrane, which allows for rapid release of their contents in response to mild hyperthermia (40-42 °C). A variety of methodologies (e.g., water bath hyperthermia, laser, high intensity focused ultrasound, and microwave) can be used to achieve local mild hyperthermia in tumor and impact drug delivery systems. However, proof of concept studies in animal models are generally costly, thus identifying less-expensive MCTS-based in vitro tumor alternatives that are reliable for initial high throughput analysis is essential for future cost containment. Similarly, PBRT is increasingly preferred over traditional X-ray-based radiotherapy due to its relatively better side effect profiles. The goal of PBRT, as with all radiation therapy, is to deliver a lethal dose of radiation to a tumor while sparing surrounding healthy tissues [8, 9]. Like LTSLs, current methods to determine PBRT effects rely on animal models or clinical trials. By choosing MCTS that have tumor-like properties, we aim to standardize methods to better reflect in vivo outcomes and improve understanding of treatment response to various dose combinations. 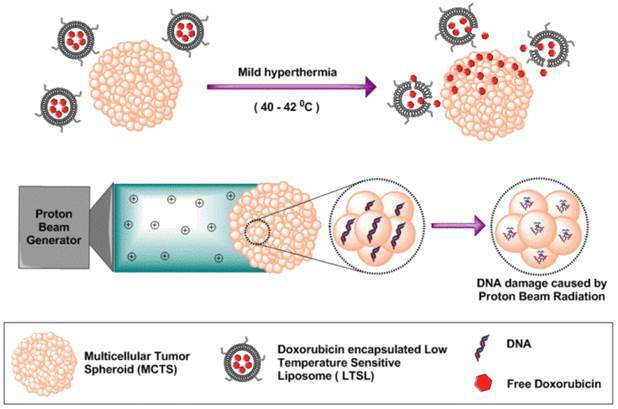 Schematic illustration of tumor spheroids as an in vitro model for determining therapeutic efficacy against proton beam radiotherapy and doxorubicin encapsulated low temperature sensitive liposomes. LTSLs were prepared by hydration of a lipid film followed by extrusion as described previously . Briefly, a mixture of three phospholipids (monostearoyl-2-hydroxy-sn-glycero-3-phosphocholine, 1,2-dipalmitoylsn-glycero-3-phosphocholine, and 1,2-distearoyl-sn-glycero-3-phosphoethanolamine-N-[methoxy (polyethylene glycol)2000]) were dissolved in chloroform at a molar ratio of 85.3:9.7:5.0. The solvent was evaporated and the resulting lipid film was hydrated with citrate buffer (pH 4.0) and extruded to yield a final lipid concentration of 50 mg mL-1. Encapsulation of Dox into the LTSLs was carried out using a pH gradient loading protocol as described by Mayer et al. . Prior to in vitro studies, the size of LTSLs was characterized by dynamic light scattering (DLS) using a ZetaPALS Phase Analysis Light Scattering instrument (Brookhaven Instruments Corporation, NY, USA). Dox release as a function of temperature (25, 37-42 °C) was assessed spectrophotometrically. All studies were performed using adenocarcinomic human alveolar basal epithelial (A549) cells as the model MCTS. Uniform sized MCTS were prepared using a liquid overlay technique by coating 96-well plates with 1% agarose (w/v) in phosphate buffered saline (PBS). A549 cells were seeded at 1-2 × 104 cells per well in 200 µL of RPMI 1640 supplemented with 10% fetal bovine serum and 1% penicillin/streptomycin. Cells were incubated at 37 °C with 5% CO2 for 2-3 days. For cell morphology characterization using scanning electron microscopy (SEM), MCTS were collected, fixed with 10% formaldehyde, washed with sodium cacodylate buffer, incubated for 1 h in 1% osmium tetraoxide in cacodylate buffer, serially dehydrated in increasing concentrations of ethanol (50, 70 90, 95, and 100%), dried in hexamethyldisilazane, coated with gold-palladium, and viewed under the SEM (FEI Quanta 600 field emission gun ESEM, Oregan, USA). Stock solutions of LTSLs and free Dox were diluted in cell culture medium and added to MCTS at a final concentration of 30 µM Dox. 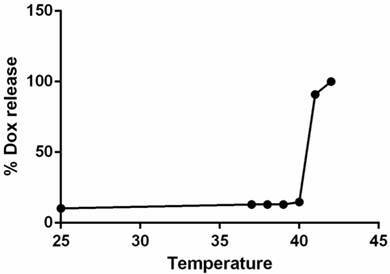 Drug delivery was achieved by heating the medium containing the MCTS (n = 8) to 40-42 °C for 30 min by placing 96-well plates in a CO2 incubator. MCTS then were further incubated for 3.5 h at 37 oC. Free Dox, LTSLs, and untreated cells were similarly incubated for 4 h at 37 °C to serve as controls. Following this treatment, MCTS were washed with PBS and re-incubated at 37 oC with 5% CO2 for 72 h in fresh culture medium. Finally, cytotoxicity was assessed using the acid phosphatase (APH) cytotoxicity assay. PBRT treatment was conducted as follows. MCTS (n = 5, 3 replicates) in 24-well plates were placed at the center of a tissue equivalent plastic phantom to mimic the irradiation environment present inside a patient during treatment. Plates containing MCTS were irradiated with a proton dose of 0 (control), 3, or 6 Gy, which corresponds to 0, 3.3, or 6.6 cobalt gray equivalent. The proton beam had energy of 150 MeV and an irradiation field size of 10 x 10 cm2. The fraction of cells in each culture that survived for each delivered dose level was determined using the APH cytotoxicity assay after 48 h.
Cytotoxicity was assessed using the APH assay. First, an APH standard curve was established to show the linearity between the number of MCTS (2-8 spheroids) and 405 nm absorbance. Briefly, MCTS were collected, washed with PBS, and incubated for 90 min in the APH assay mixture [ APH buffer (0.1 M sodium acetate and 0.1% (v/v) triton -X-100) and PBS in 3.0: 2.5 ratio 2 mg/,L of p-nitrophenyl phosphate] in an incubator at 37 °C. After incubation, 1N NaOH was added to the supernatant and absorbance was measured at 405 nm. A similar protocol was used to determine the cytotoxicity in the various treatment groups. Treatment groups were compared for differences in mean absorbance using ANOVA followed by Tukey's multiple comparisons using GraphPad Prism 6 (GraphPad Software Inc.). A p-value less than 0.05 indicated statistical significance. The hydrodynamic diameter of LTSLs measured by DLS was 106.4 ± 0.5 nm. Active loading of Dox by transmembrane pH gradient yielded an encapsulation efficiency of > 95% for Dox-LTSLs. Dox release at 37 °C was minimal compared to that at room temperature. However, nearly complete release of Dox from the LTSLs was observed at 42 °C (Fig.2) . Dox-LTSL absorbance as a function of temperature. Nearly 100% of the drug was released at ~42°C. The use of 1% agarose for coating 96-well plates provided a non-adherent surface suitable for growing MCTS that mimic in vivo tumor characteristics. 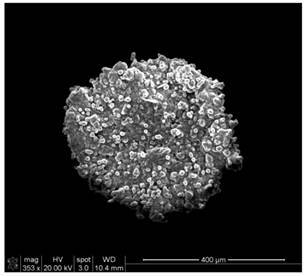 At 2-3 d of incubation, mature spheroids around 500 µm in diameter were observed. At higher magnification under SEM, compactly packed cells in the form of 3D spherical aggregates were observed with no loss of integrity due to sample preparation (Fig. 3). Scanning electron microscopic images of MCTS with a diameter of ~400 µm. The APH standard curve showed a linear relationship (R2 = 0.9969) between the number of MCTS and 405 nm absorbance (Fig. 4). As the number of MCTS increased, a proportional increase in absorbance at 405 nm was observed. In the drug response study (Fig. 5), at 37 °C free Dox- treated MCTS showed significantly lower (20-30%) viability from that in the other treatment groups (LTSL, untreated control). Conversely, at 42 °C, both free dox and mild hyperthermia in combination with LTSLs resulted in significantly reduced (20-30%) viability compared to treatments without heat. Hyperthermia alone did not affect cell viability. Viability of MCTs determined using the acid phosphatase assay. Absorbance was positively correlated with the number of MCTS. Viability of MCTS treated with LTSLs in combination with mild hyperthermia (P < 0.05; significantly different than the control). PBRT treatment of MCTS resulted in a reproducible dose-dependent reduction in cell viability (Fig. 6). A 15-20% reduction in viability compared to untreated controls was observed at 6 Gy. 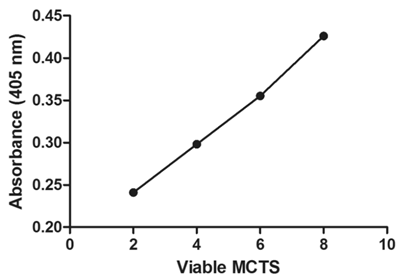 Viability of MCTS treated with PBRT; the plot shows a reproducible dose-dependent decrease in cell viability. Chemo- and radiotherapy of tumors are established treatment modalities for malignancies in which locoregional control is necessary . Currently, a significant amount of active research is aimed at improving the therapeutic response of cells using novel LTSLs and radiation treatments that can achieve targeted killing of tumor cells. The MCTS method reported herein was used to test the ability of mild hyperthermia LTSL drug delivery and PBRT to enable high throughput screening of candidate nanocarriers for potential clinical translation. Cytotoxicity was evaluated using the APH assay . This assay measures the ability of the enzyme APH, which is present in viable cells, to catalyze the conversion of the chromogenic substrate p-nitrophenyl phosphate into p-nitrophenol. In the presence of an alkaline solution, this process produces the yellow-colored product p-nitrophenolate, which absorbs optimally at 405 nm. Thus, the presence of this enzyme in viable cells is positively correlated with the product formed, and the absorbance of the final product is positively correlated with the viability of the MCTS. We found no statistical difference in the enzyme production between the control and heated cells (Fig. 3), which is important because hyperthermia in vitro can be difficult to control. However, significantly lower enzyme production was detected in MCTS that were treated with mild hyperthermia in combination with LTSLs. This finding suggests that the treatment triggered sufficient release of Dox from LTSLs in the targeted site at 42 °C, resulting in cell death. Furthermore, the cytotoxic responses were similar between LTSLs that were initially heated to induce Dox release and those that were heated in the incubators (data not shown), indicating the reliability of this methodology. Similarly, quantitative measurement of absorbance in MCTS treated with PBRT revealed a progressive decrease in absorbance in each treated group but a sustained increase in enzyme activity over 72 h in the untreated MCTS (Fig. 4). These findings are consistent with results of the traditional colonogenic assay method that measures the fraction of cells surviving for each delivered dose by incubating the cells at 37 °C for 2 weeks to allow surviving cells to form colonies, which can be ultimately stained and counted . In conclusion, the results presented herein suggest that use of MCTS can reduce the time required to estimate the success of PBRT or thermal therapy and that MCTS respond in a manner similar to that of monolayer cell culture models. In future studies, we will use this technique in theranostics assays as a versatile and simple strategy to longitudinally study nanoparticle properties in an in vitro setting. This work was supported by a multidisciplinary team grant from the Center for Veterinary Health Sciences and the College of Arts and Sciences, Oklahoma State University, and a collaborative research agreement with ProCure Proton Therapy Center, Oklahoma City.